Most modern IDEs include templates, a way to begin a new project without having to write all of the code from scratch. 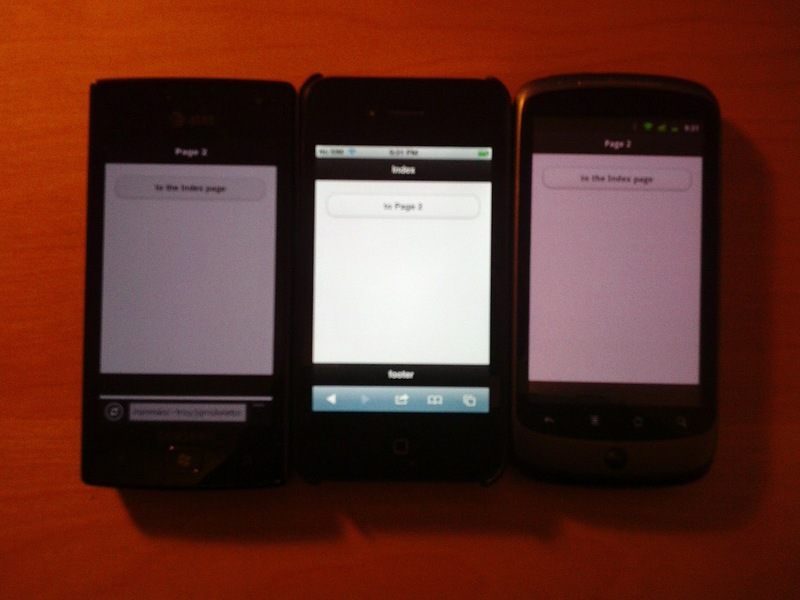 In order to speed up and standardize my jQuery Mobile development, I created a skeleton. The skeleton serves the same purpose as a template for my own projects. There isn’t anything difficult going on with the skeleton, but I will walk you through the application anyways to make sure that you understand everything. First, I should explain the files which are included in the project. 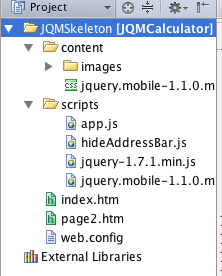 At the base of things are jQuery and jQuery Mobile core files. In a production app, I would normally get these files from a content delivery network CDN, but during development it helps to have the files local. Next, we have the app.js file. This is my application’s core file. It contains the Kernel, which sends page events to their handler. And Events, which hooks all of the page events and feeds them to the Kernel. The last part of the file are the two page handler functions. I hope this code helps you to write something cool. If it does drop me a line and an URL. Sorry about that. I am still trying to organize my projects better. This project is on GitHub now at https://github.com/Rockncoder/JQMSkeleton. I will fix the link and post accordingly. The link has been fixed. To download the zip file from GitHub. I already using your skeleton and it feels really good to have a clean seperation, little bit like a model/controller and a view. Cant thank you enough for this. ow I try to fill pages with dynamic data (from a json). Creating a link is easy, but dont have a good! idea to fill the page with the data. Thanks for your suggestions and kind words. Sorry about the links, I am in the middle of moving all of my source code to GitHub, which is taking longer than planned. After Code Camp San Diego (June 23/24), I will be releasing an updated video/tutorial combination of using jQuery Mobile, Backbone, and ASP.NET MVC in combination. This will cover handling dynamic data via a RESTful interface. An older version of the video is available on my YouTube channel. A short bit after that I will do a similar tutorial with Node.js instead of ASP.NET MVC. I always announce new tutorials on Twitter, so please follow me @therockncoder. thanks for this great skeleton which it would be very helpful and educative. Doing this, u could save one extra data param in the definition of the page and use the 'id' where the name already exists. Thanks for reading my blog and your kind words. Be sure to follow me on Twitter @therockncoder to know when new posts are released. My reason for not combining the data parameters is that in actual production code I have quite a few examples of pages which share logic. Think about things like about boxes or legal text, where the logic is the same, so I route them to the same handler. This also happens in the way I handle both responsive design and orientation change. The page looks different but the logic is the same. Having the handler not bound to the id allows me the freedom to do that. Today I've found some time to work again with your skeleton and I have a little problem. Whenever I add a js file (like the hideAdressBar and so on) at the end or the beginning of the page nothing happens. Great tutorial! Quick question: why do you include the app.js file in the body, rather than in the head? That's a great question and needs an explanation. For the user, your site loads quicker, and while they are thinking about what to do first, the rest of the site loads in. Putting JS files in the body is a recommended best practice for building fast sites.